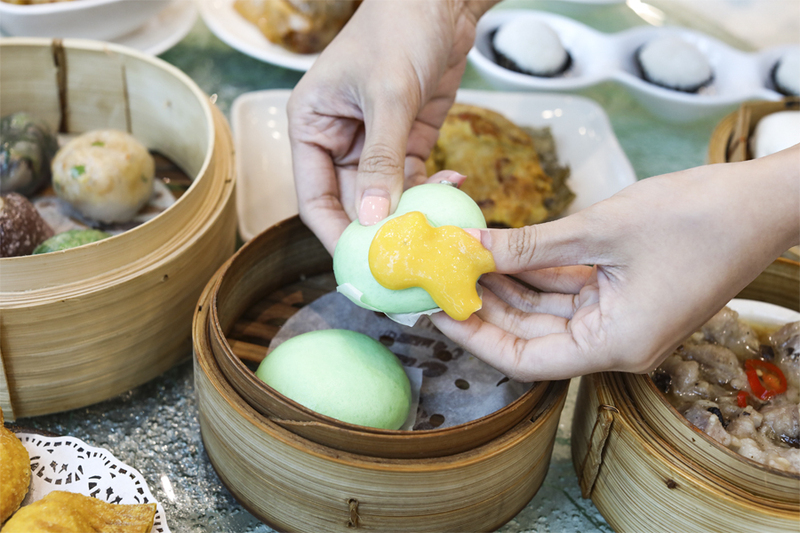 Swatow is a thriving city in the tranquil land of South China, known for its life of opera, music, gongfu tea, and of course Teochew food. 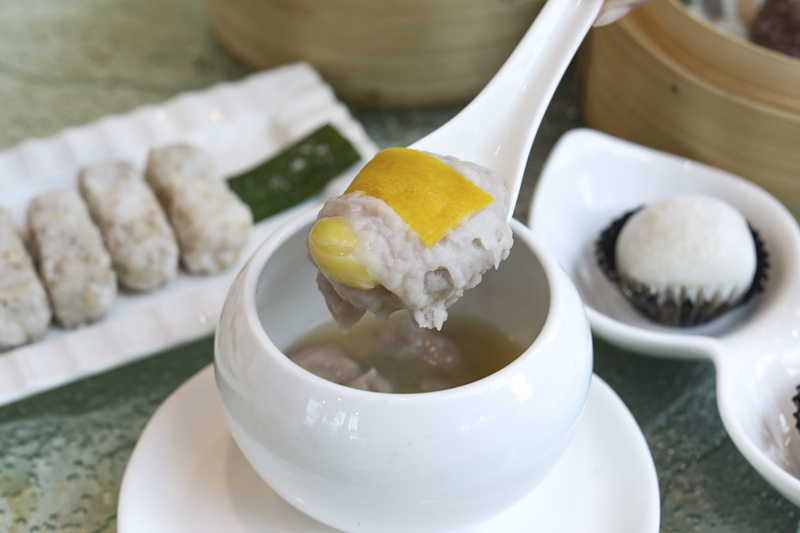 The hallmark of Teochew cuisine is its healthiness and freshness of its food especially the seafood dishes. Traditionally, cooks use only light flavouring and seasonings to bring out the natural essence of the ingredients used. 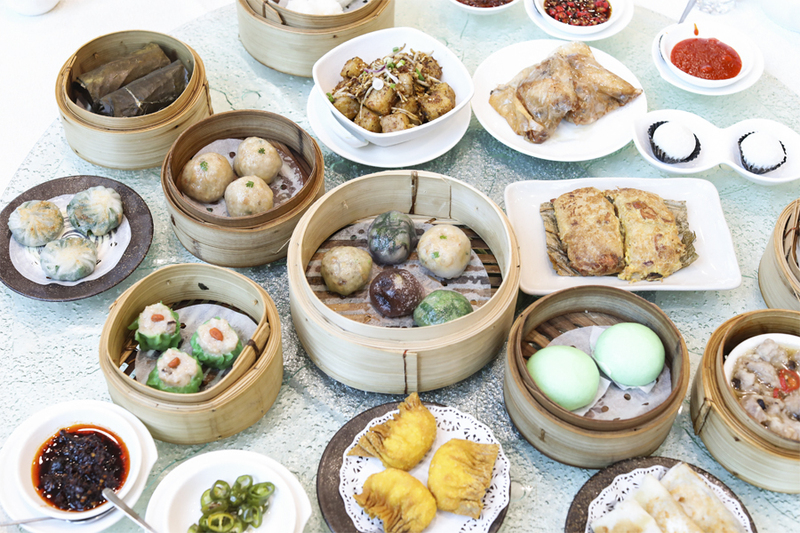 So while we have more or less seen Teochew dishes in various restaurants, authentic, traditional Teochew Dim Sum is less commonly served. 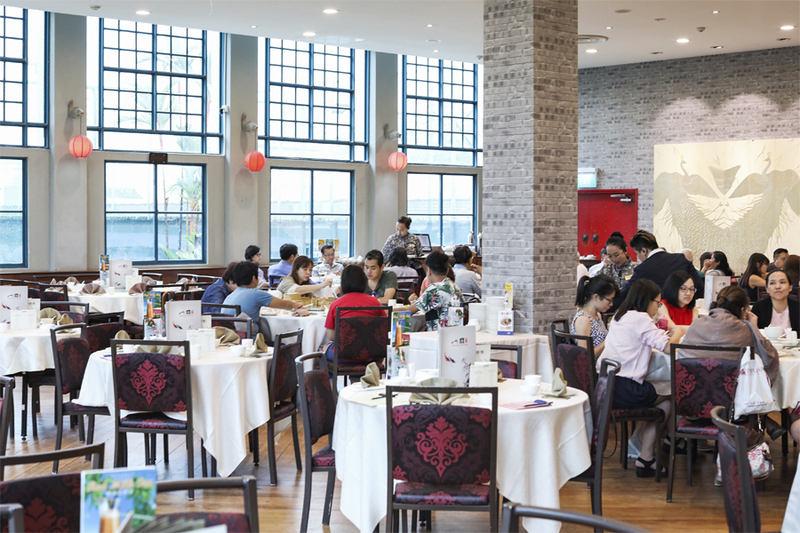 If you have cravings or plan to bring the family out for a gathering, you can experience them at Swatow Seafood Restaurant at Toa Payoh, Swatow City at Singapore Recreation Club, and Swatow Garden at Serangoon Gardens Country Club. 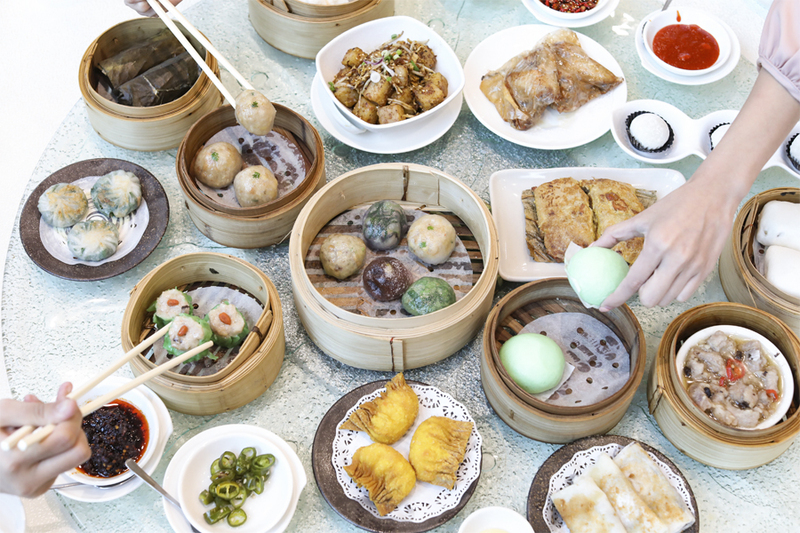 Swatow is renowned for its unique food culture derived from centuries of Cantonese food influences. 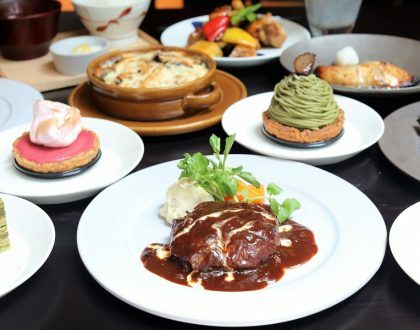 The founder Dr Jimi Tan, has put together well-known chefs from Singapore, Malaysia and Hong Kong to create a myriad of seafood, vegetarian dishes, appetizers and desserts. 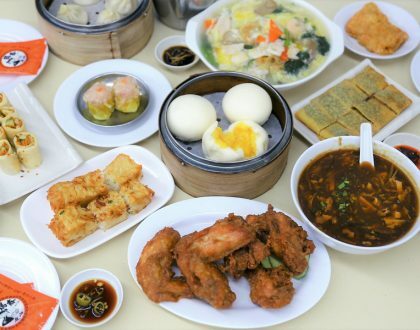 Swatow Garden offers 2 kinds of menu: Dim Sum and Teochew Delights. There are also many vegetarian options, so you won’t have any problem choosing in case you prefer non-meat dishes. Crystal dumplings are less commonly seen due to the complexity in hand-making them. The skin has to be shiny clear (thus the name “crystal”), and also allows you to see the fillings beneath without breaking. 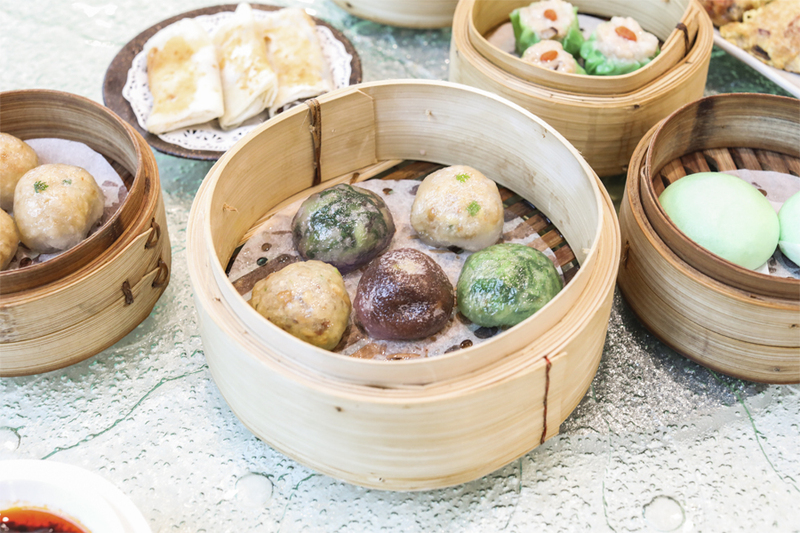 For the best of five worlds, have the sampler basket with 5 flavours of turnip, vegetarian, chye poh (preserved radish), chives and red bean. 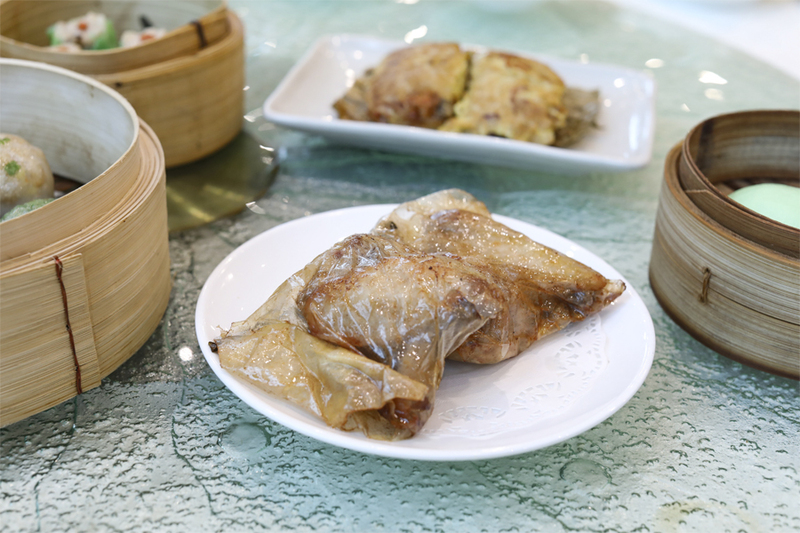 The dumplings are slightly oily on the outside so that they do not stick to the base. 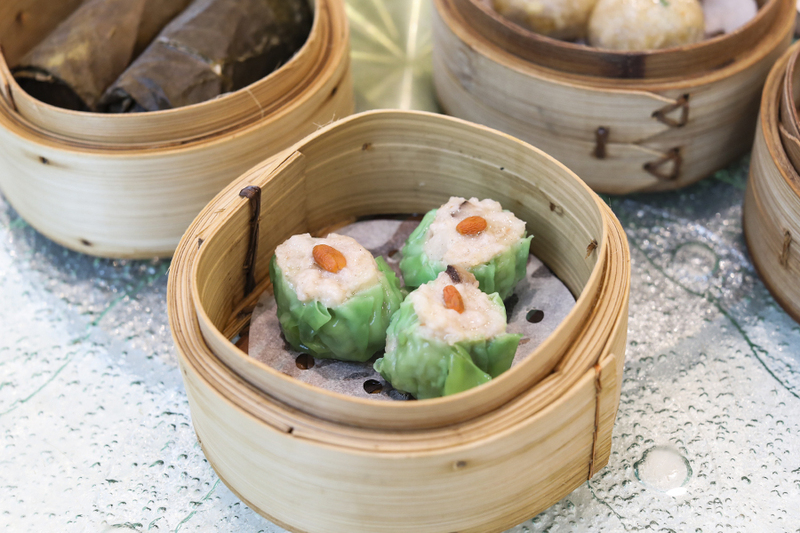 Make a go at the Chye Poh Dumpling wrapped with beautifully translucent and chewy skin, filled with crunchy vegetables and partly salty preserved vegetables. 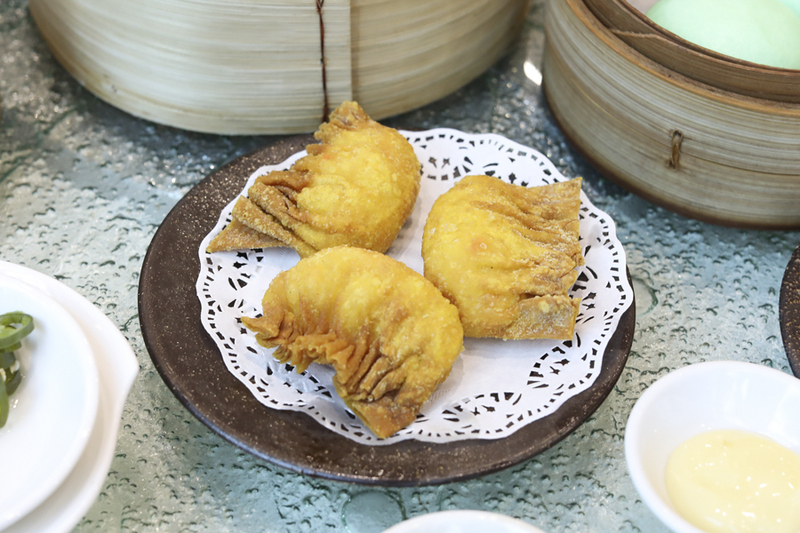 Crystal Dumplings filled with crunchy turnip – similar to what you get in a “Soon Kueh”, complete with delicate skin and a burst of flavours within. 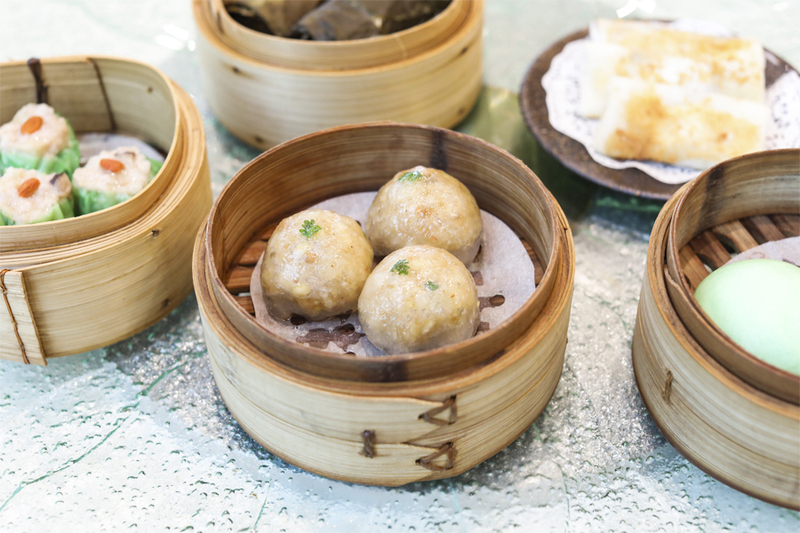 This basket of Dim Sum looked like Siew Mai but had green-coloured skin (made with spinach, don’t worry about colourings), and fillings of pork with dried shrimps, turnip, pepper and preserved radish. 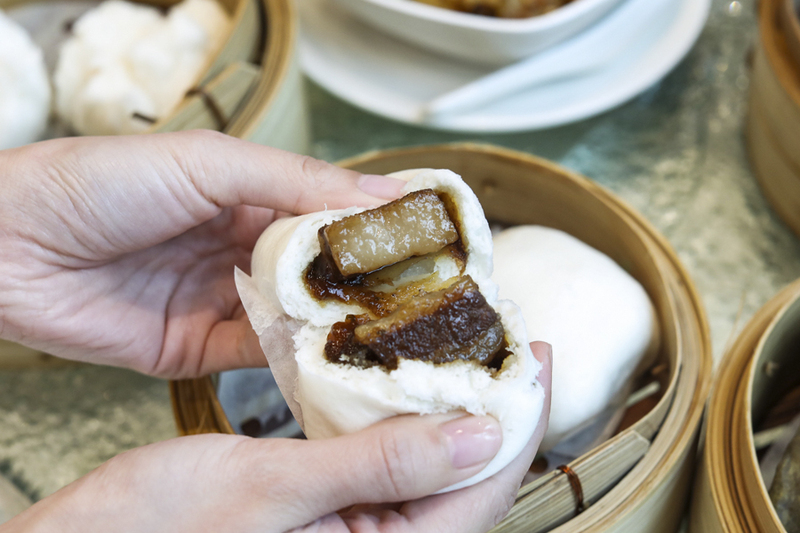 Reminiscent of the “Kong Bak Pau”, with braised pork belly in dark sauce which was soft and fragrant wrapped inside the fluffy bun. Be careful of it oozing ‘golden sand’ custard fillings. Steamed “Char Siu Bao” with roasted pork fillings which was slightly to the sweet side. This is a limited special meant for the children, but I am sure the adults will love them too. Marinated chicken parts wrapped in parchment paper and deep fried like little parcels. This is so as to lock in the flavours, and keep the chicken moist and aromatic. 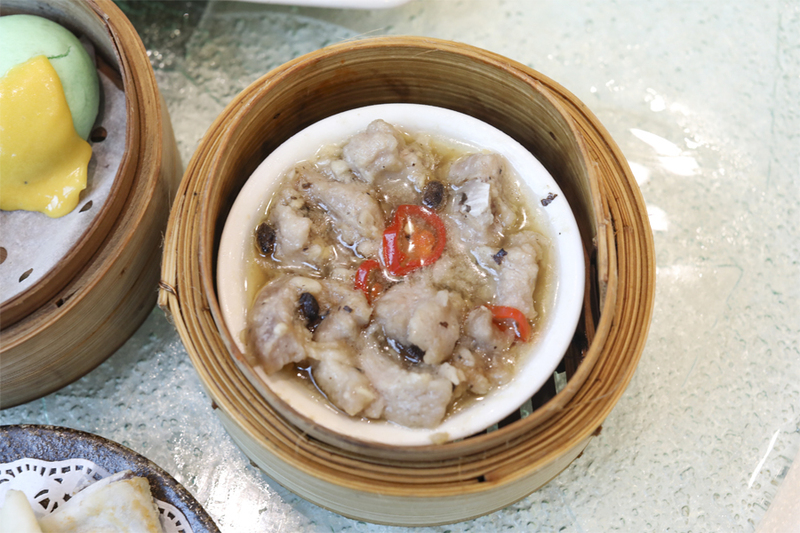 Tender pork ribs steamed with fragrant savoury black bean sauce. 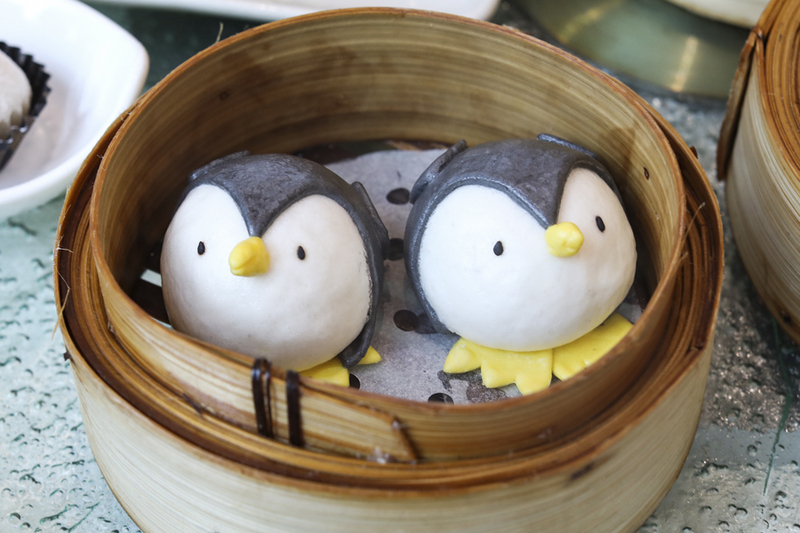 This is something I have not seen in other dim sum restaurants. 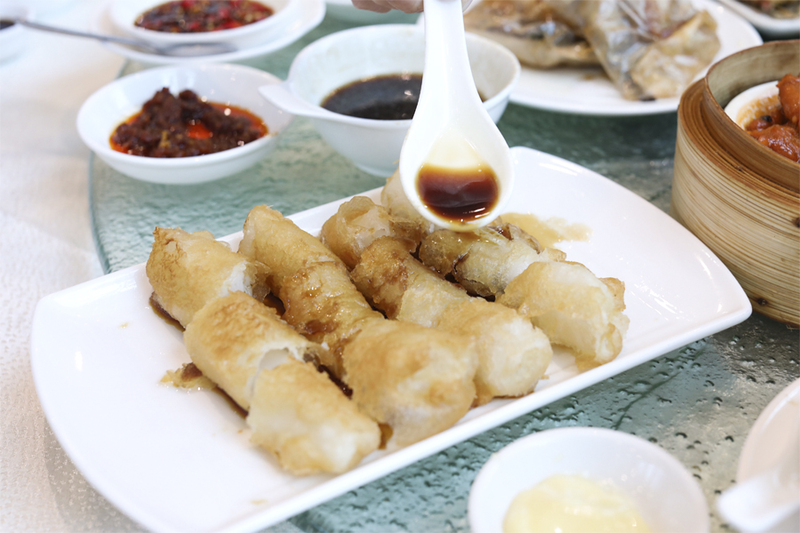 You should be familiar with “Cheong Fun” or silky rice rolls, but to have them battered and deep-fried till crisp gave it an added dimension. There is an accompanying soy based sauce which you can dip or drizzle over. Reminded me of the Sichuan style red-bean pancake, except this has both red bean and banana covered in an egg white puff. Oh, I had this in Thailand before! (But they used sticky rice.) 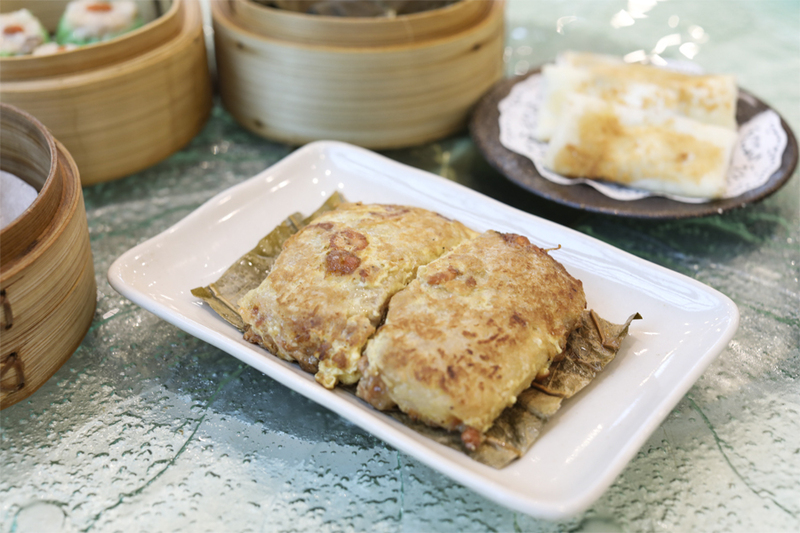 These are glutinous rice patties with egg soaked in them, then pan-fried. 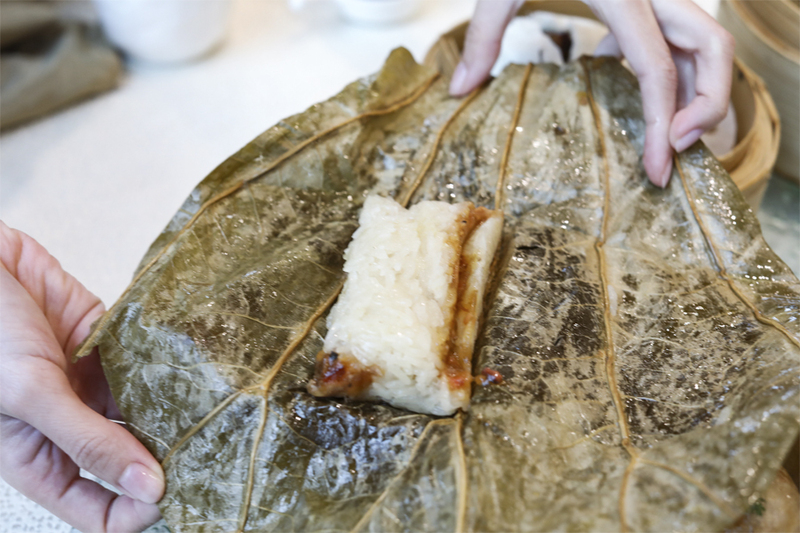 The Cantonese call this “Lo Mai Gai”, of leaf-wrapped soft glutinous rice packet with chicken. 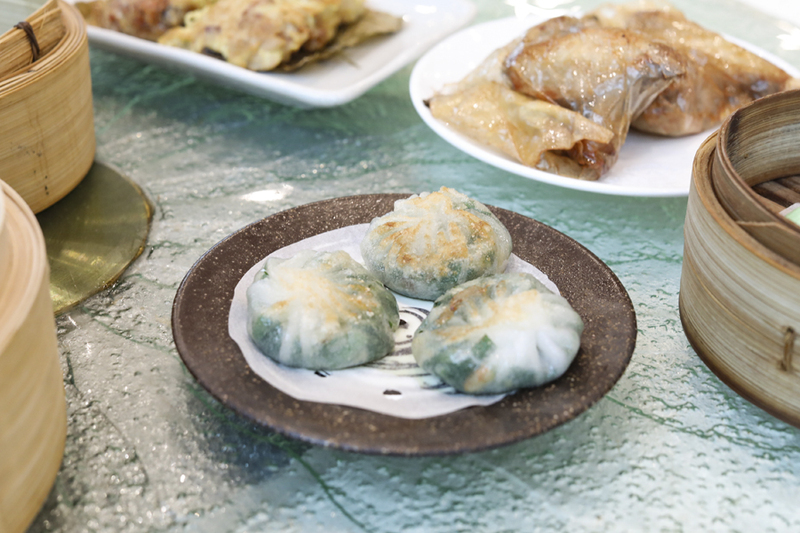 Thin dumpling pastry filled with Chinese chives then pan-fried so that the bottom of each piece is golden-brown and crispy. 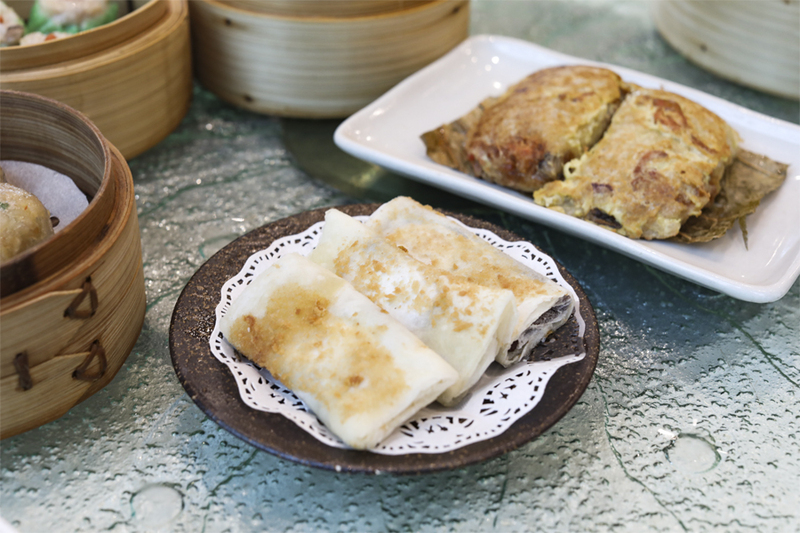 You can have the Carrot Cake pan-fried ($3.50) or stir-fried with X.O Sauce – carrot cake cubes softened and lightly browned on the sides, added with beansprouts and scallopy X. O sauce which had that punch. 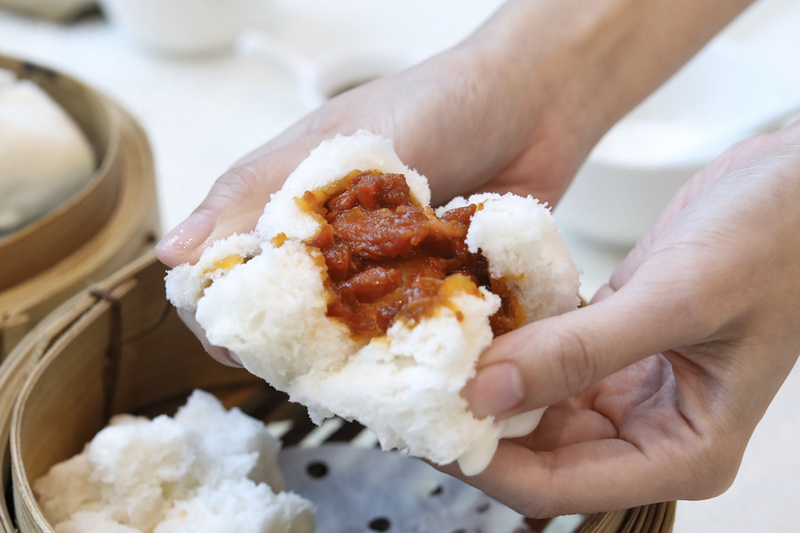 Considered a Teochew delicacy and would need some convincing if you have never tried before. 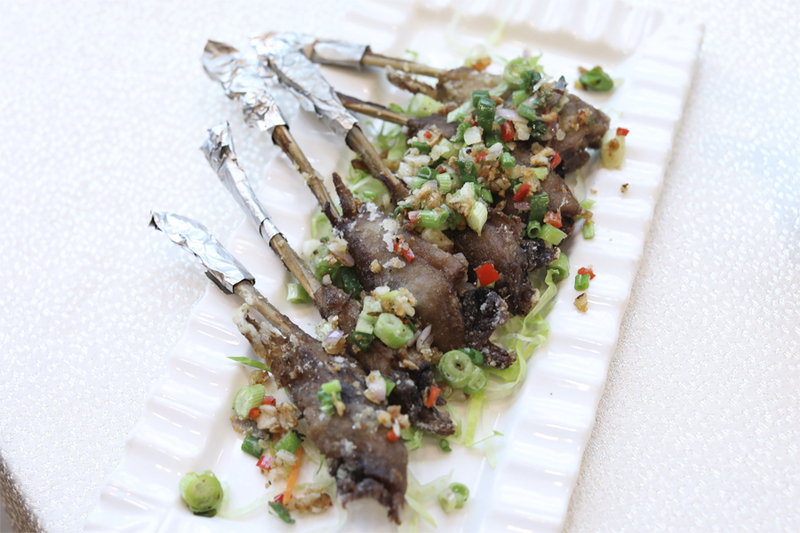 These are actually Duck Chin on sticks, deep fried till golden and peppered with spices and aromatic. I suppose those who like this would really enjoy finding this here. 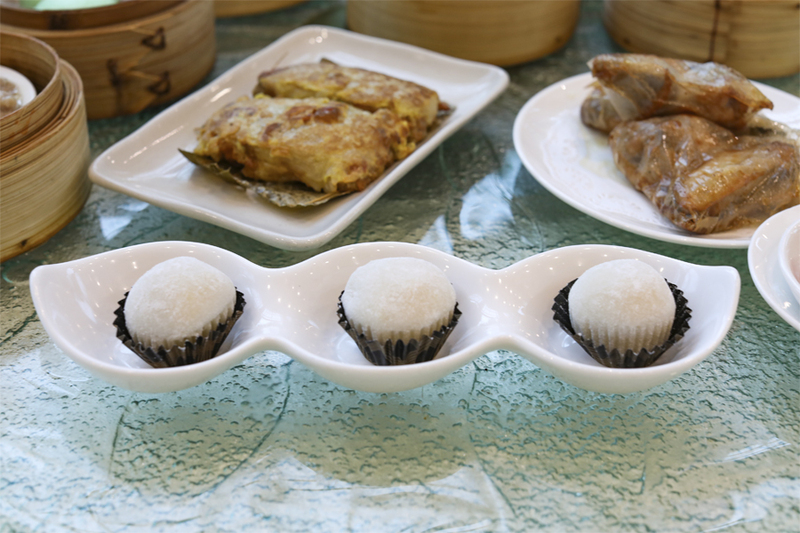 Do you know this was originally a traditional Chinese confinement food for new mothers? The dish has become more commonly seen now. The men get it too. 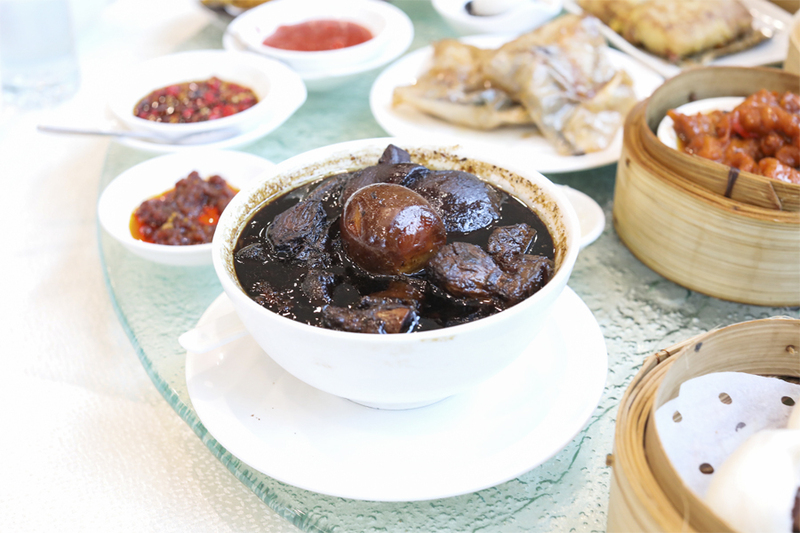 The bowl of gelatinous pork trotter was braised in a ginger and sweet black vinegar stew which had addictive sweet sour flavours. Good to go with rice. Comforting, clear peppery soup. There wasn’t this strange smell associated with this soup as the stomach and parts are thoroughly cleaned. A technically hard to prepare dish, though it looked simple. 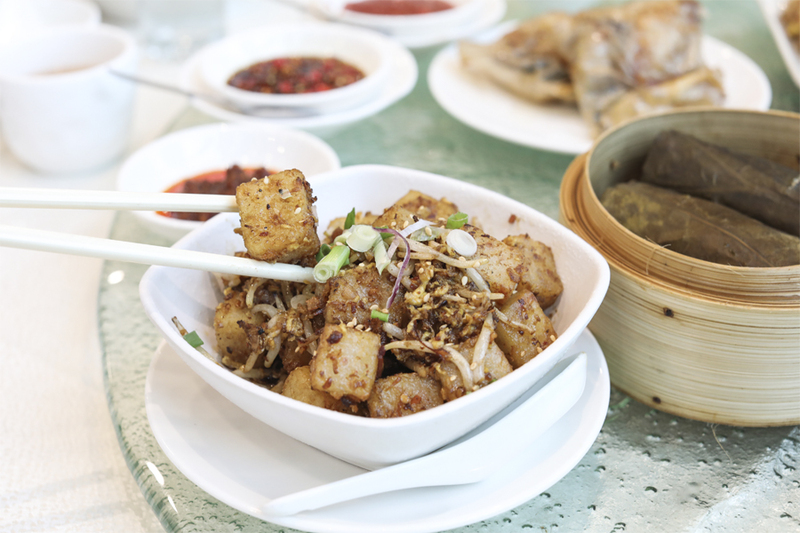 Yam cubes are skillfully fried, coated with a layer of sugar like crystal. You only know how soft it was when we tried picking them up with chopsticks – slightly more strength and the cube would break apart. Sweet treats of chewy mochi skin encasing durian meat. 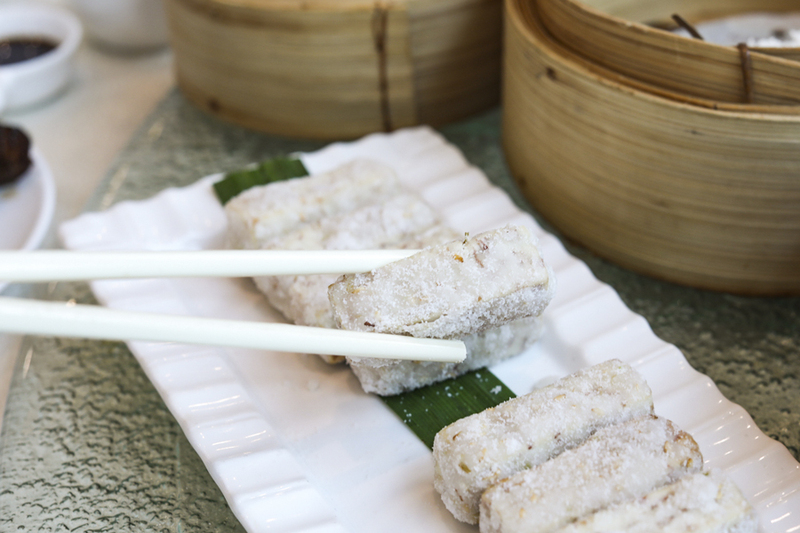 The best Teochew dessert ending to a meat would be the “Orh Nee” – loved that this wasn’t too sweet or oily. Throughout the day, you can also look forward to Teochew classics such as Braised Sliced Duck ($16), Braised Pork Belly ($8), Jellied Pork Trotter ($8), Teochew Cold Crab (S$10/100g), Teochew Style Steamed Pomfret (price varies), Golden Crispy Noodles ($16), and comforting Teochew Porridge with Sliced Pomfret (1 bowl for $6). 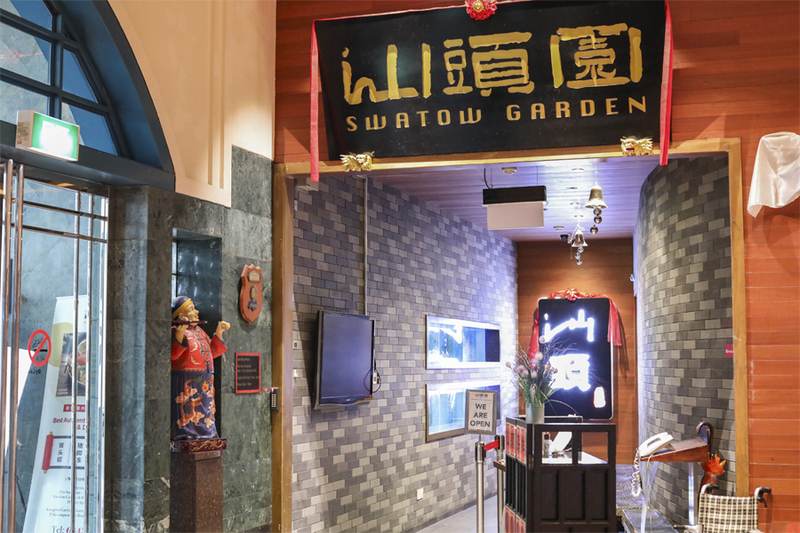 Now on getting there, Swatow Garden is located within Serangoon Gardens Country Club (Heliconia Wing). 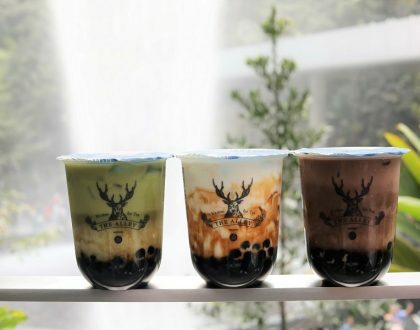 It is a short 5 minutes’ walk away from the familiar Chomp Chomp Food Centre. 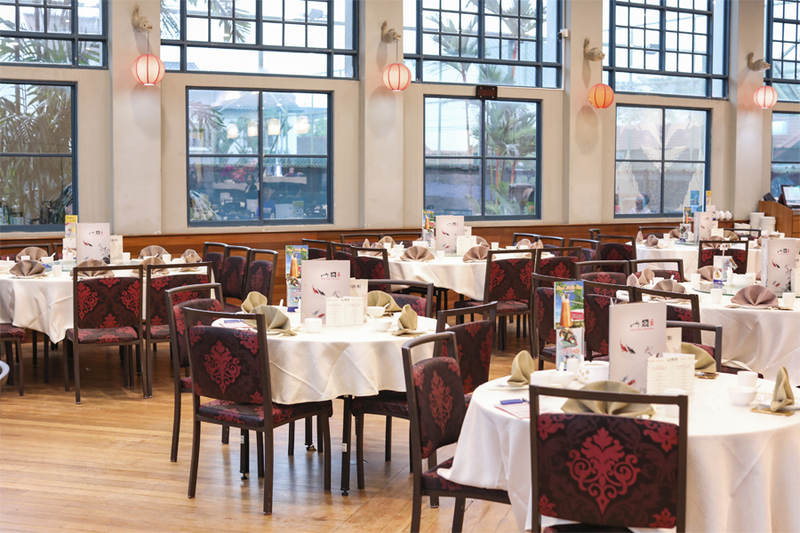 * This entry is brought to you in partnership with Swatow Garden.